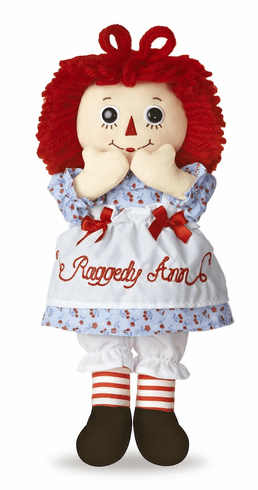 Raggedy Ann has the classic looped red yarn hair and stitched facial features. She is wearing her classic outfit which consists of a white pinafore apron with Raggedy Ann embroidered in script on the front of it layered on top of a blue dress with red flowers scattered about the dress. White bloomers, the classic red and white striped legs, and black shoes complete this timeless, huggable ensemble.